We’re cranking along in a project and someone comes in with a ‘brilliant’ idea or a new documentation requirement. AUGHH! Time is ticking, money is being spent. Why couldn’t this have been brought up at the beginning of the project?!?! Agree to parts of the request and move the rest into the next version. All three of these cause angst to the team, to management, and perhaps even the users. They result in more time and money being spent. Creativity likewise drops as people go into crunch mode trying to accomplish more with less. So, why would anyone want to embrace this? We all have a tendency to look at projects as totally linear processes. Everyone agrees up front what needs to be done, money is allotted, a timeline is set and everyone is off to the races. The project moves into execution mode – efficient execution. But, we also know that projects aren’t linear phenomena. They’re a combination of fits and starts, looping back, problems and solutions. When we first embark on projects, we keep our fingers crossed and hope that nothing gets in the way of launching the product – that there is no Scope Creep. As the project progresses we continue with the same mentality, constantly moving forward but at the same time looking over our shoulders, trying to anticipate what might occur before it does. We hope nothing will knock us off our tenacious trek towards launch – especially no new product requirements. Nevertheless, these new requirements seem to come and wreak havoc. But, there is a bright side. 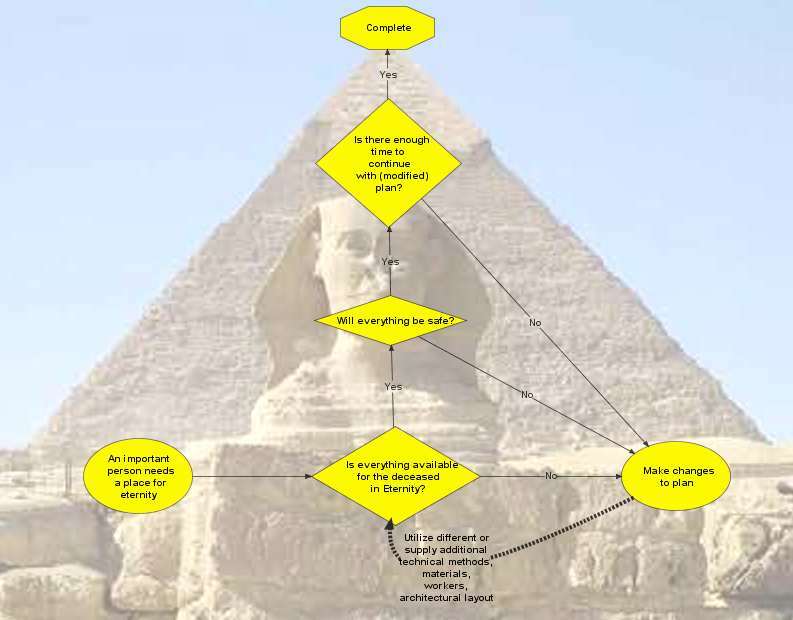 Since the ancient Egyptians didn’t technically document their design process, I decided to do some reading and tease out the process that they used to design and construct the pyramids. What I came up with is diagrammed below. Their overarching concern was obvious: build a suitable eternal home for their ruler in a limited time. Of the above 5 constraints, two constraints were non-negotiable: ‘Guiding Perspectives on the Afterlife’ and ‘Time’. Their Perspectives on the Afterlife dictated what must be contained in the tomb from foodstuffs to boats, to how the tomb was constructed. Time, or rather, time to the death of the ruler, was a powerful, non-negotiable constraint. The structure basically had to be completed in time for the entombment. These two constraints impacted the other three constraints as is clear from the archeological record. The materials used, the technologies chosen for building aspects of the tomb, the abandonment of various aspects of the tomb and focus on other areas, the use of more or less workers, the change in architectural layout during the course of construction, all these were done in response to the non-negotiable constraints.